GEO ExPro - How Much Oil? World oil output continues to increase – but if we experience a decline next year, it might be a consequence of lack of investments since 2014. “The energy transition is taking place much faster than most people realise” is a commonly heard phrase. The backdrop here is that the old economy, fuelled largely by fossil fuels, is being replaced by one powered by renewables, in particular solar and wind energy. The reason, they say, is obvious: the cost of solar panels and windmills are falling fast in a growing number of electricity markets. Have you heard this before? Is it correct? Or are the fortune-tellers being too optimistic about how fast the transition is moving? Using BP as a source it can be shown that the world’s oil production has risen from 65,800 bpd in 1992 to 92,200 bpd in 2016. This is equivalent to an increase of 40%, or, to put it differently, an average increase of 1.35% annually. The largest annual increase in this 25-year period was experienced as recently as from 2014 to 2015, when the growth was almost 3,000 bopd. The last decline from one year to the next was from 2008 to 2009 (a percentage decrease of almost 1%). Those old enough will associate this with the financial crisis that hit the world in 2008; it had nothing to do with renewables. Interestingly, oil production also increased last year, from 2015 to 2016, but the growth rate of 0.5% was less than the 25-year average. The graph below illustrates another important point. The growth is by no means even and in four of the years from 1992 to 2016 we experienced a decline. Predicting future production from this curve is therefore without value if we know nothing about investments in oil production. For example, while oil and gas companies have spent considerably less since the oil price went to rock bottom in 2014 (as we have all experienced), production has remained relatively stable since 2015. The explanation is straightforward: projects committed to at a high price – when it was too late to reverse decisions – have come into production. The situation is different for mature fields that need infill drilling to prevent declining production. Short-term investments are easy to postpone. 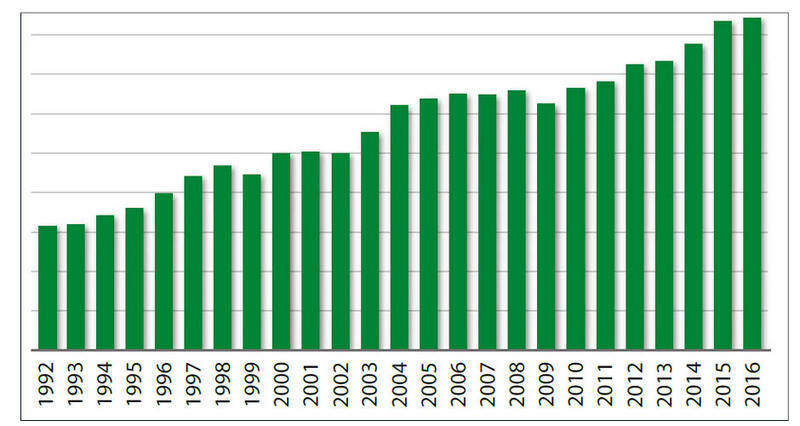 World-wide production of oil from 1992 to 2016 according to BP Statistical Review of World Energy. For clarity the baseline is 50,000 bopd. The lesson to be learnt is that if we see reduced production next year, the reason might be that oil is being replaced with renewables – or it may be the result of not enough investment in new projects following the 2014 disaster. The graph below demonstrates that oil has (still) not been replaced by renewables. The next report from BP will be met with curiosity. How Much is ‘A Tiny Fraction’ 20 Years From Now? The world’s use of energy will increase in years to come. There is plenty of oil to cover demand. However, the big question is if, and possibly at what rate, renewables will substitute fossil fuels. It is difficult to make predictions about the future. This is also true when it comes to oil production.